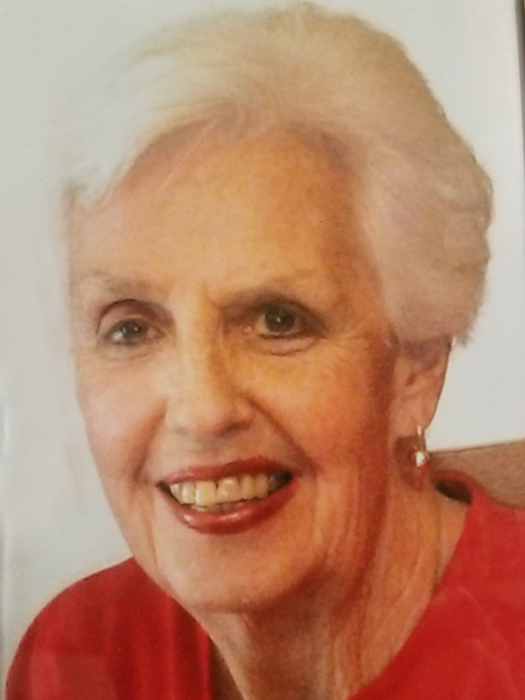 Marilyn Laurene Kennon, 87, passed from this life and into heaven on Tuesday, April 9, 2019. She was born the youngest of six children to parents Franz Elmer Hokanson and Mathilda Elizabeth (Breitung) Hokanson on September 30, 1931 in Denver, CO. She attended school in Denver until the family moved to Taos, NM for her father's health. She attended Taos High School as an active, fun-loving teenager with friends, Geraldine Brooks, Patsy Dickerson, and Ann Liebert. She enjoyed ice skating and hiking with her friends. As a cheerleader, she met a certain football player named Ray Kennon whom she married following high school graduation on August 27, 1950. The couple had four children: Rae Lynn, Cheryl Diane, Cynthia Sue, and Scott Allen. As Dad worked the family business (Kennon Builders), mom became super-mom keeping up with four growing children and their varied interests during their school years. She was an accomplished seamstress making most of the girls' school clothes, prom dresses, and even wedding dresses. She enjoyed her vegetable garden each summer and had fond memories of Scott eating peas out of the pod before she could harvest them for dinner. Mom attended every school event possible including Rae Lynn's cheer leading at football games, Cheri's drama productions, Cindy's barrel racing and roping with dad, and Scott's baseball games. She was there for PTA meetings, parent/teacher conferences, Brownies, Girl Scouts, and chauffeuring her children to endless activities. She was a force to be reckoned with if you made her angry. She was on a bowling team, played golf with friends in Angel Fire, enjoyed rodeos, camping, and had many special friendships nurtured when families were together. When dad built their adobe home, mom turned thousands of adobes in the sun so that they would cure. She was a go-getter! Most of all, Mom was an avid animal lover. Our family had quarter horses, Shetland ponies, and an assortment of dogs and cats. She once saved a calf out of a rain-swollen stream while its mother stood helplessly on the bank. As Mom drove past and noticed the calf, she stopped the car, ran to the field and into the stream, picked up the calf and then found herself in trouble when she couldn't support its weight. Two men driving by witnessed and joined the effort and the calf was saved! She was the best at rescuing birds out of the jaws of cats. As an empty nester, she discovered her talent for sales. Working for Taos Drum for many years she could have extensive conversations with tourists about silver jewelry and drums. She modeled for Betty Roy and the well-known Taos Dress Company. She later worked for Taos artist, Jackson Hensley and her knowledge of art and local artists was quite impressive. She operated a bed and breakfast after convincing Dad to convert a workshop into an apartment for skiers and tourists. She enjoyed having visitors from all over the country and the guest book reflects her success in providing a comfortable and homey accommodation for weary travelers. She loved people and rarely met anyone she didn't like. Marilyn was preceded in death by her parents and siblings, husband Ray, son Scott, and son-in-law Kenny Motherway. She is survived by Rae Lynn (Kirk) Shropshire, Cheryl (Chris) Whitney, Cindy Motherway, grandchildren Matthew (Deborah) Jones, Joshua (Angie) Jones, Amber Shropshire and Sarah (Gavin) Shropshire Ryan, Brad Motherway, great-grandchildren Erik Jones, Leah Jones, and Madeline Jones and special friends Geraldine, Patsy, and Ann Liebert. Cremation will take place. Mom and Dad's remains will be interred at a later date in Taos. Our family wishes to thank the staff at Cranes Roost in Aztec for their care and the staff at Cedar Ridge Inn for their outstanding care during mom's short stay there. We also want to thank Dr. Robert Burns for his service to our family. Marilyn's care is entrusted to Brewer, Lee and Larkin Funeral Home, 103 E. Ute Street in Farmington, NM. (505) 325-8688. You may share condolences with the family on our website: www.serenityandcompany.com http://www.serenityandcompany.com.